Sourced from the finest sustainable tree plantations in Indonesia, our Modular 12 Bottle Wine Rack is now more durable, more beautiful and more eco-friendly than ever before. Hand-cut and hand-sanded allowing for even coloring and grain, and less dark markings. Complete with solid pine dowels and pegs for fast assembly vertically, horizontally or on an angle...the choice is yours. New and Improved--Stronger in Mahogany! Sourced from the finest sustainable tree plantations in Indonesia, our Modular 12 Bottle Wine Rack is now more durable, more beautiful and more eco-friendly than ever before. Hand-cut and hand-sanded allowing for even coloring and grain, and less dark markings. 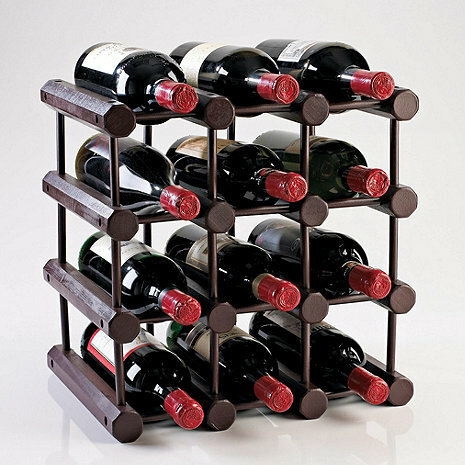 A strong quality wine rack that is expandable on all four sides and extremely versatile. Complete with solid pine dowels and pegs for fast assembly vertically, horizontally or on an angle...the choice is yours. Complete kit holds 12 bottles and can fit champagne bottles. For measuring purposes: Multiply 4" by the number of openings across or vertically and add 1-3/8" to the total of each. Can you add to this rack to hold double? BEST ANSWER: You could do the 40 bottle modular rack and build it 5 bottles high+ 1 on top and 5 bottles wide. You will have some left over which you could use as small table top racks if you want. BEST ANSWER: Thank you for your question: the depth i s11"D .For measuring purposes: Multiply 4" by the number of openings across or vertically and add 1-3/8" to the total of each. I have a space measuring 22" W x 42" H. Is it correct that I could fit 5 columns x 10 vertical rows (depth is not a problem)? Would this modular structure support this height? Can the assmbly be anchored to the wall? Thanks! BEST ANSWER: You are correct in a space that is 22"W x 42"H you can get 5 columns x 10 vertical rows. You can buy a bracket at a hardware sore and bracket to the wall but this is not necessary. what are the dimensions for this? BEST ANSWER: 13 3/8" x 13 3/8 " x 11"
What is the maximum width and height? No instructions for assembly although it seems to be a no-brainer--just pound dowels into holes. But it turns out there is a best way to do it otherwise you might have to disassemble it and start over. This happened to me and I broke a couple of dowels but fortunately there were extra. Tip: assemble a complete row (4 posts with 6 dowels) first. Then put in 8 connector dowels. Then assemble next complete row (as before) and when complete, attach to connector dowels. In other words, work with self-contained layers, not 3-dimensionally or diagoally. If I hadn't of had a livingsocial deal I don't know that I would have paid full price for this wine rack. It is sturdy but not as nice as in the picture, plus putting it togther was very difficult since I do not own a rubber mallet. Nice appearance, difficult to assemble. I have used these type of modular racks before without difficulty. But this set was difficult to assemble because the pegs would not fit holes without moderate pounding to the point that I broke one peg in the effort. Perhaps the stain/paint used expanded the diameter of the pegs. Looks easy as Tinkertoy to assemble. BUT wood is hard as concrete and needs to be sanded to fit together. I should have believed the reviews. Not like any wood I have ever worked with. Ding, I do not recommend this unless you are trying for a lesson in patience. While leery of the reviews claiming assembly difficulties, I ordered three sets. Using a rubber mallet, I assembled them into an integrated rack exactly matching my needs in two hours. I broke one dowel, and simply reoriented that piece to hide the hole with the bid of dowel stuck in it. Multiple extra dowels were included, so in the end it made no difference. The dowels fit snugly, which is exactly what I wanted because this is what gives the rack such good stability. Incidentally, I am a 62-year-old woman with no special mechanical skills or training. From my perspective, the assembly difficulty should deter no one who does not have unreasonable expectations. Modular wine rack fits perfectly into a space in my boat's salon. It holds bottles securely when the boat is underway, and, if we expect rough water, it accommodates bungee cords to secure the bottles. We receive many compliments on this wine rack. I bought a vintage washstand and this fit perfectly on the lower shelf for a nice wine table. I love it! The wood is unnaturally hard and NO WAY the pegs fit in the holes without altering them. If you know that upfront, you will not be disappointed. When all together, very nice looking. That assembly is required is a somewhat hidden detail in the product description and also surprising given that WE charges extra postage to mail the unassembled rack. I am a city dweller and don't have a workroom to pound this object together. I recommend avoiding this product if you are in a similar situation. Here's the trick to assembling this thing. Squirt a tiny bit of WD-40 into each hole. I had tried sanding the paint off but that was really not pleasant. This works. Of course you have to clean it up to get rid of the smell but that's what paper towels are for. Well worth the money and can easily be expanded. I store bottles of wine until consumed. The design offers the ability to put the rack in any room I desire.